Searching for Parallel Haskell? DPH is a fantastic effort, but it's not the only way to do parallelism in Haskell. Try the Parallel Haskell portal for a more general view. Data Parallel Haskell is the codename for an extension to the Glasgow Haskell Compiler and its libraries to support nested data parallelism with a focus to utilise multicore CPUs. Nested data parallelism extends the programming model of flat data parallelism, as known from parallel Fortran dialects, to irregular parallel computations (such as divide-and-conquer algorithms) and irregular data structures (such as sparse matrices and tree structures). An introduction to nested data parallelism in Haskell, including some examples, can be found in the paper Nepal – Nested Data-Parallelism in Haskell. This is the performance of a dot product of two vectors of 10 million doubles each using Data Parallel Haskell. Both machines have 8 cores. Each core of the T2 has 8 hardware thread contexts. Data Parallel Haskell (DPH) is available as an add-on for GHC 7.4 in the form of a few separate cabal package. All major components of DPH are implemented, including code vectorisation and parallel execution on multicore systems. However, the implementation has many limitations and probably also many bugs. Major limitations include the inability to mix vectorised and non-vectorised code in a single Haskell module, the need to use a feature-deprived, special-purpose Prelude for vectorised code, and a lack of optimisations (leading to poor performance in some cases). The current implementation should work well for code with nested parallelism, where the depth of nesting is statically fixed or no user-defined nested-parallel datatypes are used. Support for user-defined nested-parallel datatypes is still rather experimental and will likely result in inefficient code. DPH focuses on irregular data parallelism. For regular data parallel code in Haskell, please consider using the companion library Repa, which builds on the parallel array infrastructure of DPH. Note: This page describes version 0.6. * of the DPH libraries. We only support this version of DPH as well as the current development version. Disclaimer: Data Parallel Haskell is very much work in progress. Some components are already usable, and we explain here how to use them. However, please be aware that APIs are still in flux and functionality may change during development. From a user's point of view, Data Parallel Haskell adds a new data type to Haskell –namely, parallel arrays– as well as operations on parallel arrays. Syntactically, parallel arrays are like lists, only that instead of square brackets [ and ], parallel arrays use square brackets with a colon [: and :]. In particular, [:e:] is the type of parallel arrays with elements of type e; the expression [:x, y, z:] denotes a three element parallel array with elements x, y, and z; and [:x + 1 | x <- xs:] represents a simple array comprehension. More sophisticated array comprehensions (including the equivalent of parallel list comprehensions) as well as enumerations and pattern matching proceed in an analog manner. Moreover, the array library of DPH defines variants of most list operations from the Haskell Prelude and the standard List library (e.g., we have lengthP, sumP, mapP, and so on). As a consequence, parallel arrays are always finite, and standard functions that yield infinite lists, such as enumFrom and repeat, have no corresponding array operation. Moreover, parallel arrays only have an undirected fold function foldP that requires an associative function as an argument – such a fold function has a parallel step complexity of O(log n) for arrays of length n. Parallel arrays also come with some aggregate operations that are absent from the standard list library, such as permuteP. This code uses an array variant of parallel list comprehensions, which could alternatively be written as [:x * y | (x, y) <- zipP xs ys:], but should otherwise be self-explanatory to any Haskell programmer. Unfortunately, we cannot use the above implementation of dotp directly in the current preliminary implementation of DPH. In the following, we will discuss how the code needs to be modified and how it needs to be compiled and run for parallel execution. GHC applies an elaborate transformation to DPH code, called vectorisation, that turns nested into flat data parallelism. This transformation is only useful for code that is executed in parallel (i.e., code that manipulates parallel arrays), but for parallel code it dramatically simplifies load balancing. Unfortunately, vectorisation does not handle type classes at the moment. Hence, we currently need to avoid overloaded operations in parallel code. To account for that limitation, we specialise dotp on doubles. As the current implementation of vectorisation cannot handle some language constructs, we cannot use it to vectorise those parts of the standard Prelude that might be used in parallel code (such as arithmetic operations). Instead, DPH comes with its own (rather limited) Prelude in Data.Array.Parallel.Prelude plus three extra modules to support one numeric type each Data.Array.Parallel.Prelude.Float, Data.Array.Parallel.Prelude.Double, Data.Array.Parallel.Prelude.Int, and Data.Array.Parallel.Prelude.Word8. These four modules support the same functions (on different types) and if a program needs to use more than one, they need to be imported qualified (as we cannot use type classes in vectorised code in the current version). Moreover, we have Data.Array.Parallel.Prelude.Bool. If your code needs any other numeric types or functions that are not implemented in these Prelude modules, you currently need to implement and vectorise that functionality yourself. Special care is needed at the interface between vectorised and non-vectorised code. Currently, only simple types can be passed between these different kinds of code. In particular, parallel arrays (which might be nested) cannot be passed. Instead, we need to pass flat arrays of type PArray. This type is exported by our special-purpose Prelude together with a conversion function fromPArrayP (which is specific to the element type due to the lack of type classes in vectorised code). Using this conversion function, we define a wrapper function for dotp_double that we export and use from non-vectorised code. It is important to mark this function as NOINLINE as we don't want it to be inlined into non-vectorised code. The syntax for parallel arrays is an extension to Haskell 2010 that needs to be enabled with the language option ParallelArrays. Furthermore, we need to explicitly tell GHC if we want to vectorise a module by using the -fvectorise option. Currently, GHC either vectorises all code in a module or none. This can be inconvenient as some parts of a program cannot be vectorised – for example, code in the IO monad (the radical re-ordering of computations performed by the vectorisation transformation is only valid for pure code). As a consequence, the programmer currently needs to partition vectorised and non-vectorised code carefully over different modules. We need the -threaded option to link with GHC's multi-threaded runtime and -fdph-par to link with the standard parallel DPH backend. We include -rtsopts to be able to explicitly determine the number of OS threads used to execute our code. We compile and link the program as described above. NOTE: The code as presented is unsuitable for benchmarking as we wouldn't want to measure the purely sequential random number generation (that dominates this simple program). For benchmarking, we would want to guarantee that the generated vectors are fully evaluated before taking the time. The module Data.Array.Parallel.PArray exports the function nf for this purpose. For a variant of the dot-product example code that determines the CPU time consumed by dotp_wrapper, see timed dot product. By default, a Haskell program uses only one OS thread, and hence, also only one CPU core for execution. To use multiple cores, we need to invoke the executable with an explicit RTS command line option — e.g., ./dotp +RTS -N2 uses two cores. (Strictly speaking, it uses two OS threads, which will be scheduled on two separate cores if available.) To determine the runtime of parallel code, measuring CPU time, as demonstrated in the timed variant of the dot product example, is not sufficient anymore. We need to measure wall clock times instead. For proper benchmarking, it is advisable to use a library, such as criterion. A beautiful property of DPH is that the number of threads used to execute a program only affects its performance, but not the result. So, it is fine to do all debugging concerning correctness with just one core and to move to multiple cores only for performance debugging. Data Parallel Haskell –and more generally, GHC's multi-threading support– currently only aims at multicore processors or uniform memory access (UMA) multi-processors. Performance on non-uniform memory access (NUMA) machines is often bad as GHC's runtime makes no effort at optimising placement. Further examples are available in the examples directory of the package dph source. This code also includes reference implementations for some of the example that are useful for benchmarking. The interfaces of the various components of the DPH library are in the library documentation on Hackage. Data Parallel Haskell is a high-level language to code parallel algorithms. Like plain Haskell, DPH frees the programmer from many low-level operational considerations (such as thread creation, thread synchronisation, critical sections, and deadlock avoidance). Nevertheless, the full responsibility for parallel algorithm design and many performance considerations (such as when does a computation have sufficient parallelism to make it worthwhile to exploit that parallelism) are still with the programmer. The tree is inductively defined; hence, tree traversals will proceed sequentially, level by level. However, the children of each node are held in parallel arrays, and hence, may be traversed in parallel. This structure is, for example, useful in parallel adaptive algorithms based on a hierarchical decomposition, such as the Barnes-Hut algorithm for solving the N-body problem as discussed in more detail in the paper Harnessing the Multicores: Nested Data Parallelism in Haskell. For a general introduction to nested data parallelism and its cost model, see Blelloch's Programming Parallel Algorithms. 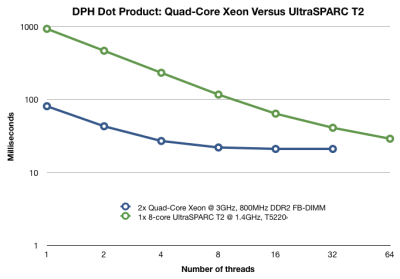 DPH has two major components: (1) the vectorisation transformation and (2) the generic DPH library for flat parallel arrays. The vectorisation transformation turns nested into flat data-parallelism and is described in detail in the paper Harnessing the Multicores: Nested Data Parallelism in Haskell. The generic array library maps flat data-parallelism to GHC's multi-threaded multicore support and is described in the paper Data Parallel Haskell: a status report. The same topics are also covered in the slides for the two talks Nested data parallelism in Haskell and Compiling nested data parallelism by program transformation. For further reading, consult this collection of background papers, and pointers to other people's work. If you are really curious and like to know implementation details and the internals of the Data Parallel Haskell project, much of it is described on the GHC developer wiki on the pages covering data parallelism and type families. This page was last modified on 12 July 2012, at 10:35.